The coastline is lined up with various sizes of fishing boats. People from neighbouring villages have come; some to buy and some to sell their goods. I see varieties of fish; tilapia, herring, mackrel, baracuda in different sizes, lying in the sand as fishermen bargain with the women fishmonger who have come to purchase them. This is what this little fishing village of Mania in Bonthe District used to look like. The economy thrived and businesses flourished. I visited Mania village again in 2010 on what I once knew as a market day. I was surprised to find just few boats and this time with little or no catch at all. There were a handful of people around but it was not as lively as it was when I first visited. I wondered why there was just little catch. Have the fishes migrated to a place where they would not be caught? I was unsure of what was going on but one thing I observed was that the fishermen do not look so happy and they wore sad faces. Curious to find answers to the questions playing up in my mind, I approached Kabba Kain a local fisherman and asked him why was there such little catch. What he explaind to me was shocking and I had to confirm from other fishermen in the area. They all told me the same story. The fishermen complained that some foreign trawlers always come to fish where they have cast their nets. That, was not only destroying their nets but preventing them from having good catch. They also complained that because catch is poor, business dwindles. For communities like Mania, fishing is the only source of livelihood. If foreign trawlers are creating tension on the local fishers, should the authorites then not pay attention to the issue? Sierra Leone has plentiful natural resources and its productive coastal waters are an invaluable source of food and employment for its people. It has a coastline that is fed by a number of rivers and abundant rainfall which in turn provide some elements for a productive marine fisheries. The fisheries sector has been contributing immensely to the country’s economic development. According to the Minister of Fisheries Dr. Soccoh Kabia, the fisheries sector is contributing about 10% to the country’s GDP. 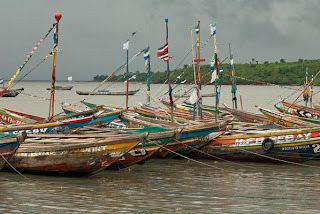 The West Africa Regional Fisheries Project (WARFP) of the Ministry of Fisheries, states that the fisheries sector is providing employment for an estimated 100,000 persons directly and, indirectly for about 500,000 persons. This represents 10% of the country's population. Information from the same source states that the coastal areas; Bonthe, Shenge, Tombo to name a few, are made up mostly of fishing population, and about 25% of the male population of working age is involved in part-time or full-time fishing. As a consequence of the civil war, the government lacked capacity to monitor and control its coastal waters. 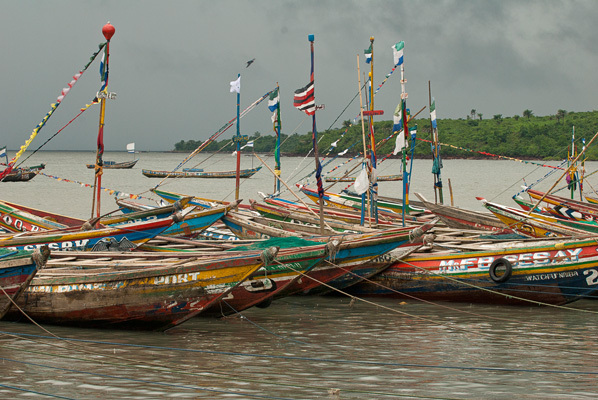 Foreign illegal fishing vessels have multiplied, plundering the rich waters of Sierra Leone. “It is estimated that the country is now losing almost $29 million every year to illegal fishing operators - a potential developmental income that local communities and the government cannot afford to lose. What is even more annoying is the fact that the country does not benefit anything out of its own resources.” complains Victor Kargbo, Fishing Protection Officer of the Ministry of Fisheries. As defined in the UN Convention on the Law of the Sea (UNCLOS), Illegal Unreported and Unregulated or IUU fishing means “fishing activities which are illegal, unreported or unregulated". The convention further clarifies how fishing can be illegal, unreported and unregulated and maintained that IUU fishing is a crime and authorizes sanctions against any country or company that engages in the act – the basis for detering and preventing IUU fishing by means of international law. IUU fishing has been identified as a serious global problem; one of the main impediments to the achievement of sustainable world fisheries. According to Illegal-fishing.info, IUU fishing is worth between $10bn and $23.5bn per year, representing a major loss of revenue, particularly to some of the poorest countries in the world where dependency on fisheries for food, livelihoods and revenues is high. IUU fishing respects neither national boundaries nor international attempts to manage high seas resources. It thrives where governance is weak and where countries fail to meet their international responsibilities. It puts unsustainable pressure on fish stocks, marine wildlife and habitats, subverts labour standards and distorts markets. Now, to curb this global problem, the UNCLOS has put forward certain regulations to prevent, deter and elliminate IUU fishing. According to articles 44 and 45 of the Law of the Sea, member states shall impose sanctions ranging from suspention of authority to fish, withdrawal of fishing rights to confiscation of illegal fishing gears, catches or fisheries products of any fishing vessle conducting IUU fishing activities on their waters. Sierra Leone's coastlines is occupied by numerous fishing communities where the people's only source of livelihood is fishing. Through such economic activities, parents are able to school their children and take care of their homes. As a consequence of the civil war, the governments have fragile administrative capacity, weak regulations and corrupt officials who would do anything to survive the harsh conditions of the country. Cound not a situation like this attract illegal fishing vessles? The Sierra Leone Fisheries law do not permit any fishing vessle to fish within 35 Nortical Miles of the Inshore Exclusion Zone or IEZ. It also forbids vessles to fish on its waters without permit or flags of convenience. However, due to lack of monitoring capacity, the ministry could not detect fishing vessles that violate this policy. A video documentary by Aljazeera's Juliana Ruhfus in collaboration with Environmental Justice Foundation in October 2011 showed how fishing vessles from Asia and other parts of Europe [Ocean 3 and Sea Queen] fish illegally in the IEZ in Sierra Leone. These fishing vessles turn off the vessle's monitoring system so they could not be detected, paint the vessle black, obscure the identity of the vessle, are without Flags of Conveinence and fish in unauthorized locations. Could these be the very ones the fishermen complained about? According to the UNCLOS article 3(f), a vessle is said to be illegal when it “falsifies or conceals its markings, identity or registration [...]”. This is exactly how foreign vessles violate the laws and exploit the country's waters, taking away the fisheries products without the knowledge of authorities. But how do the vessles come to fish on the waters illegally? IUU fishing occurs in virtually all captured fisheries ranging from fisheries under national jurisdiction to high seas fisheries. It weakens the ability of the fisheries sector to meet national and global economic, social and environmental objectives and threatens the livelihoods of people who depend on fishing. However, given the importance of developing countries in the international fish trade, measures to reduce IUU fishing will fail if developing countries are not active participants in the fight to ensure legal and sustainable fishing practices. According to chapter 4 of the UNCLOS, regional fisheries management organizations, with the active support of the community have established an array of measures designed to counteract IUU fishing. One such organization is the West Africa Regional Fisheris Project for Sierra Leone which is implemented by the Ministry of Fisheries and Marine Resources. This $28 million project is funded by the International Development Association and Global Environmental Facility of the World Bank. It is established to strengthen the capacity of the country to manage its fish industry by reducing IUU fishing and adding local value to fish products across the country. Satellite technology and automated information system is one way to provide adequate monitoring of the waters. “It has been quite challenging to effectively monitor and control the waters in the past, but now we can tell who is at sea through our satellite monitoring technology” said Dr. Salieu Sankoh, Project Coordinator of the West Africa Fisheries Project in Freetown. With this type of radar technology, a vessel can be detected at 35 nortical miles of the coastal waters and with patrol boats, ministry authorities can surveillance the waters and arrest any illegal vessle. Victor Cole Country Representative for EJF Sierra Leone recommends creating a regular monitoring and control task force for all coastal waters in the country. “If we have a regular patrol team, illegal vessles will be afraid of being caught and that would scare them away” he says. “Since we began to patrol the sherbro waters regularly and provide evidence to the ministry, most of the trawlers have fled for fear of being arrested”. Another effort to control illegal fishing is to engage community participation. In doing this, WARFP has established community management fisheries committees for four Marine Protected Areas MPAs within local fishing communities along the coastlines. These committees are responsible to control all fishing activities in their areas and report any illegal fishing to the ministry which then makes the arrests. “The community management committees have been very cooperative and our fishing businesses are returning to normal” reported Mary Walters a senior fishmonger in the sherbro island. More support comes from other partners and stakeholders. For example, the Environmental Justice Foundation EJF is working directly with fishing communities in Shenge in the Sherbro Island of Bonthe to promote community surveillance. The US Naval command and the Joint Maritime Committee are both working together to monitor and control the waters to curb not just illegal fishing but transnational organized crime such as drug and human trafficking. Furthermore, the Food and Agricultural Organization FAO is also giving logistical support and training to the ministry and as recent as April 2012, the ministry's joint operation's committee at Murray Town received 6 computers and 4 printers as support from FAO says Handel Mac-Williams, Communication Officer FAO. Arresting illegal fishing vessles involves legal support. So far, the ministry has made 8 arrests between 2011 and early 2012; most recent a French Vessle “TV Sterenn” which was fined $703 thousand. According to Dr. Sankoh, 80% of the arrests made are from trawlers fishing within the IEZ. The revenue generated in the form of fines is about $1 million and according to Dr. Sankoh, these monies are paid into the country's consolidated fund. The ministry's effort to control the waters is not unconnected with challenges. There are other areas to strengthen in order to put a final hold on this problem. The ministry still needs more patrol boats, total control over the entire fishing industry and better conditions of service for personnel to prevent professional malpractices. Furthermore, the government needs strong collaborative support from other states within the UN and the EU to end this problem. When Dr. Soccoh Kabia made his Keynote address at the international forum for IUU fishing in London, he said the ministry generated over $3 million in total revenue. Yet the ministry lacks patrol boats? Is the ministry not supposed to use the revenue it generates for its operational benefits? I think it is time the ministry became more responsible and decides how the revenue it generates is used to foster a smooth operation.